When you stay at ELLA Bar, Bistro & Bed in Patong, you'll be near the beach, just steps from Patong Beach and 8 minutes by foot from Bangla Road. This hotel is 0.7 mi (1.1 km) from Jungceylon Shopping Center and 4.5 mi (7.3 km) from Karon Beach. When you stay at Horizon Patong Beach Resort & Spa in Patong, you'll be in a shopping district, just steps from Patong Beach and 10 minutes by foot from Bangla Road. This family-friendly resort is 0.7 mi (1.1 km) from Jungceylon Shopping Center and 4.6 mi (7.5 km) from Karon Beach. A stay at Apsara Residence places you in the heart of Patong, within a 10-minute walk of Bangla Road and Jungceylon Shopping Center. This hotel is 0.4 mi (0.6 km) from Patong Beach and 3.2 mi (5.2 km) from Karon Beach. Make yourself at home in one of the 18 air-conditioned rooms featuring refrigerators and LCD televisions. Complimentary wireless Internet access keeps you connected, and cable programming is available for your entertainment. Private bathrooms with showers feature rainfall showerheads and complimentary toiletries. Conveniences include safes and desks, and housekeeping is provided daily. With a stay at Bel Aire Resort Phuket in Patong, you'll be in a shopping district, within a 10-minute walk of Patong Beach and Bangla Road. 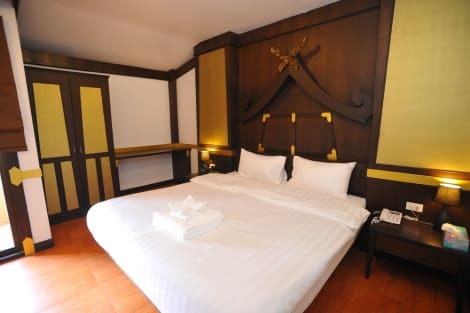 This hotel is 0.5 mi (0.8 km) from Jungceylon Shopping Center.